Pictured: The trucks that transported it and other trucks of the same company offloading ore at warehouse facilities on the premises of the port. Photographs: Courtesy of various contributors to the Luderitzbucht – Past and Present Facebook page. Sporadic labour and other types of unrest and the subsequent disruption of port operations in South Africa over the past few years created an opportunity for the harbour at Lüderitz to capitalise on new demand and become an important point of export for manganese ore mined at Kathu in the Northern Cape Province. 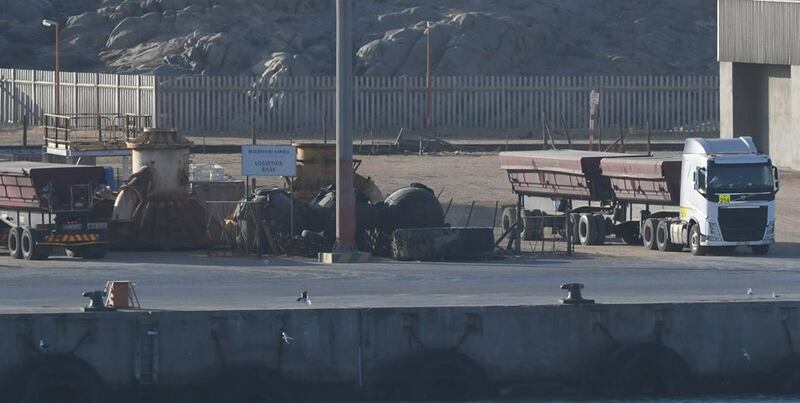 However, as the first trucks loaded with South African manganese arrived in the historic harbour town to offload the first part of a consignment of 30 000 tonnes, residents strongly protested to various authorities to bring about a halt in the stockpiling of the ore at a former road construction camp situated about two kilometres outside Lüderitz citing health and environmental endangerment. Concerned residents and various environmental protection groups soon discovered that the company who brokered the deal to import and export of the manganese ore, Trade Port Namibia (Pty) Ltd, did not have the necessary environmental clearance certificate to stockpile the raw material destined for China at the premises they selected. This led to eight trucks still loaded with ore being impounded by the Namibian Police. An emergency meeting in Lüderitz on Sunday between the various stakeholders in the venture saw the Ministry of Environment and Tourism granting the Namibian Ports Authority temporary permission to offload and store the manganese ore in warehouses facilities built for bulk storage. The eight trucks impounded by the police were subsequently allowed to offload inside the warehouses while the stockpile at the old road construction camp will now also be moved to the enclosed environment of the warehouses. Mr. Elias Mwenyo, Manager: Business Development at Namport and acting Chief Executive Officer confirmed the granting of the temporary arrangement and said all necessary mitigating measures were taken and implemented before all 248 tonnes of manganese ore were offloaded and existing stockpile will moved to the warehouse facility following remedial measures and conditions set by the Ministry of Environment and Tourism..
During January 2018 Namport announced that it has approached various potential business partners like Trade Port Namibia to target amongst others, the manganese mining industry of the Northern Cape to boost export volumes through the port of Lüderitz. In an effort to convince mining houses in neighbouring South Africa of the strategic location and potential of Lüderitz as a point of export, a consignment of 9000 tons of zinc ingots were loaded onto a vessel bound for China to test the bulk handling capacity of the port. 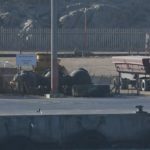 As a result Namport announced that it will be able to accommodate consignments as large as 30 000 tons at Lüderitz, provided that the bulk vessel’s draft does not exceed the shallow depth of the port. Several bulk carriers are specifically designed with a shallow draft for just such a purpose. Mr. Mwenyo said the effort to boost cargo volumes through the port of Lüderitz was not only for the benefit of Namport but also for the upliftment of the town’s local economy as well as the region through which the hundreds of trucks would move to fill the consignments of ore to be loaded onto ships. Mr. Mwenyo said Namport adheres to the highest international ISO standards and condemn actions which would cause negative consequences for human or environmental sustainability. With regards to the further management and handling of the manganese ore Mwenyo said that once Trade Port Namibia as the broker of the import and export deal manages to secure an environmental clearance certificate from MET the plan to export regular consignments of 30 000 tonnes of manganese ore at a time through the port of Lüderitz is likely to continue.